When looking at the best pay per click (PPC) management companies you want to find a company that is going to truly be a partner for your business. You also want to pick an agency that knows what they are doing or you could waste a lot of money. One of the unique advantages of PPC marketing is that you are targeting customers that are actually searching for a particular product or service. They have a need or want in that moment and you have the opportunity to get in front of them. In addition, you only pay when an interested person clicks on your ad. CyberSerge is one of the best ppc companies to work with in regards to setting up and managing your PPC campaigns. We understand Google’s quality score and can help you improve it, which reduces your cost and improves your ROI. With CyberSerge, PPC is easy, collaborative, and can generate an immediate return on your investment. PPC Audit and Competitor Analysis – This is where we can show you what your competitors are bidding on, their average position, the ad copy they are using, what their landing page looks like, average monthly budget, and when they make changes to their campaigns. 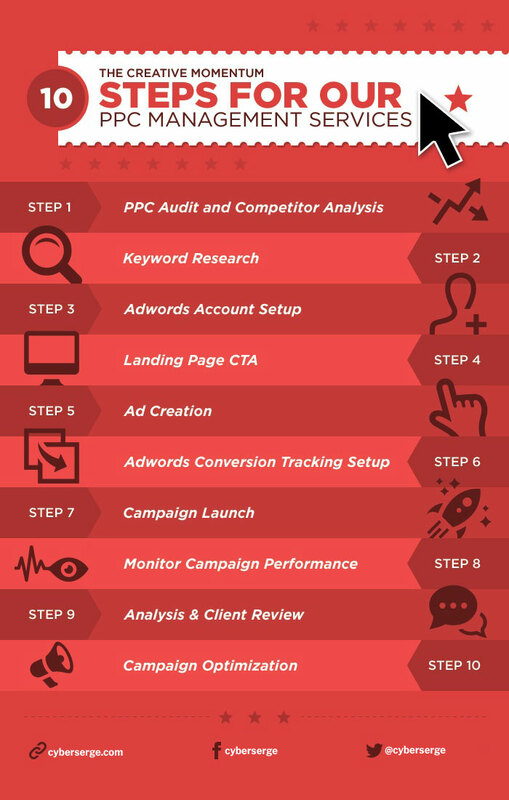 If you have a current PPC campaign that is running, we will do a full PPC Audit for you to see how we can drive better results for you. Keyword Research – Keyword research is the heart of your campaign and one of the most important steps. You want the right kind of visitors to your website, not just visitors. CyberSerge takes a look at things like sorting and organizing your keywords, keyword difficulty, making sure we are targeting the right keywords, long tail keywords, and adding negative keywords. Adwords Account Setup – Your account structure is like your motherboard for your computer. This is where all of your settings are with regards to your campaign. Google Adwords is constantly changing and making updates. CyberSerge has experts that set up your account in the most effective ways. We make sure things like budget are set appropriately, landing pages are setup, ads, locations, etc… Basically everything! Not having a well-structured account is like trying to fly an airplane that is not properly built. But don’t worry, sit back and relax –that’s why our clients hire us! Landing Page CTA (call to action) – Optimizing landing pages can be crucial to your PPC campaign. Your customer clicked on your ad and they are at your front door. Now you need to convert them as quickly as possible. We follow landing pages best practices to create pages that give you the highest conversions. Ad Creation – Ad creation is all about your value proposition. This is where you want to stand out from your competitors. Our team can help you identify your differentiating characteristics and help write a killer CTA (call to action). We take advantage of things like ad extensions, engaging headlines, testing multiple ads, and inputting the most effective keywords for your campaigns. Adwords Conversion Tracking Setup – Now that the campaign is setup, we can show you how many of those clicks are resulting in sales! This can be used to showcase leads, sales, downloads, or e-mail sign-ups for example. Our experts will discuss with you on what you consider a conversion so we can appropriately set this up for you. Campaign Launch – Our team reviews your campaign to ensure everything is working, the correct settings are enabled, and the budget is correct. Now that CyberSerge and you have put in all the hard work, it’s time to launch and start generating leads and ultimately revenue! Monitor Campaign Performance – CyberSerge is constantly reviewing your campaign such as the status, CTR (Click Through rate), Avg. CPC (Cost-per-Click), keyword costs, and the user’s behavior. Analysis & Client Review – Our team will put together an analysis for your business and review this with you ongoing throughout the campaign. It’s important that as we partner with you, that you have visibility into what is going on and how your adwords campaign is running. Campaign Optimization – As your adwords campaign is running, it’s important for our team to continually optimize it over the duration of the campaign. We focus on improving your conversion potentials, attracting the right customers, keyword opportunities, and ad creations.